The Fight for Constitutional Carry Starts Today! Moments ago, the gavel fell on the start of the 2018 legislative session here in Des Moines! That means the start of the fight for Constitutional Carry is officially underway, a fight that I hope you’ll get involved in right away. Iowa politics are anything but predicable. One thing we know for certain is that the type of pro-gun legislative majorities we have right now won’t be around for long — which is why we have to press ahead now and make Constitutional Carry the law in 2018! As a reminder, Constitutional Carry is the very simple idea that if you are legally allowed to own a firearm, you should be legally allowed to carry that firearm for self-defense. No adding your name to a government database. No having to pay fees and deal with bureaucratic hassles. No more having to obtain government permission to exercise a pre-existing and Constitutionally guaranteed right. It’s just the Second Amendment, the way our Founding Father’s intended it. What’s more, Constitutional Carry is sweeping the country as thirteen states have now enacted this critical legislation in the last couple of years — including neighboring Missouri! And in the states that have this law on the books, crime rates are decreasing — even over states that have ‘Shall Issue’ laws on the books! Of course the FAKE NEWS from Cedar Rapids to Sioux City -–still bitter about the passage of Stand-Your-Ground law last year — will be nothing short of hysterical in their predictions about blood in the streets. It’s a boringly familiar tune. They made the same predictions in 2010, when we passed ‘Shall Issue,’ and again last year when we passed Stand-Your-Ground law. They’ve been wrong time and time again, but that’s not going to stop them from trying to stop us this year. Nor will it stop Bloomberg-funded front-groups from spreading their lies. But just because you and I know that Constitutional Carry is the right thing for Iowa, doesn’t mean that the legislature will push it through without a fight! The politicians in Des Moines are quick to make a deal, trying to appear reasonable in front of the media. This will be even more true this session, with elections right around the corner. Gun owners should remember just how close we came to losing the all-important immunity language in Stand-Your-Ground law last year, as weak-kneed legislators initially removed it from the bill to placate anti-gun legislators. So please get ready, this is going to be a very busy session. If you’ve not already done so, please make sure you’ve signed your petition in support of this legislation right now! Once you’ve done that, be sure to forward this to your friends and family and encourage them to sign it, too! P.S. Moments ago, the gavel fell on the start of the 2018 legislative session –- meaning our fight for Constitutional Carry is officially underway. In the near future, we’ll be asking you to pour pressure on your legislators to ask them to cosponsor this legislation. For the moment, make sure you’ve signed your petition in support of Constitutional Carry legislation right away! We’ve made a lot of progress in the recent past in our fight for the Second Amendment — but we can’t rest until Iowa joins the other thirteen states that have already passed this critical legislation! So sign your petition and then get ready for a busy session! 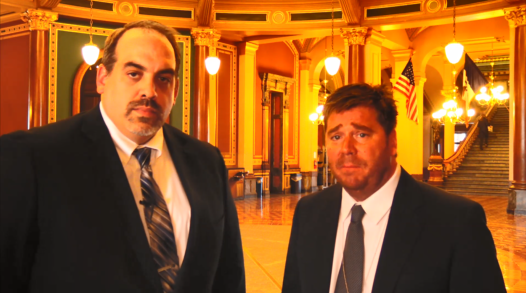 Announcing IGO’s Constitutional Carry Bill Sponsor! Where Do YOU Want Us to Fight in 2018?